This is part one of a three-part series on how to start trail running around Vancouver. See posts two and three. The popularity of trail running has been exploding in North America and especially here in Vancouver. The reasons are many; it’s good for your health, better for your body than running on pavement, never boring, and a great way to meet new people. If you’ve thought about trail running before – or are just starting out – this series of three posts are meant to give you an overview of everything you’ll want to know about the sport. This first post will cover the basics of what trail running is all about and how to get started. There is also a list of resources and local athletes to connect with at the bottom. Trail running isn’t intimidating. It doesn’t mean you have to run a 100 miler, go vegan and eat chia seeds all day, and/or grow a beard (although beards are scientifically proven to make men run 14.2% faster). Trail running is simply about being out in nature, placing one foot in front of the other, and repeating for as long you feel like. So why should you consider trail running? If you’re a fan of Vancouver Trails, I don’t need to preach to the converted about the joys of getting outside. There are many reasons, but most notably is that it can open up a whole new world to you, as it did for me. More so than hiking, trail running can get you to new trails, vistas and summits you’ve never seen. In Vancouver and beyond. I used to love hiking until I found trail running. Now I find hiking slow and cumbersome. Don’t take that as a slag to hiking. But it actually annoys me to go so slow and for it to take, say, 8 hours to finish a hike I can run in about 5 instead. And that’s not to say I’m able to run the entire stretch of trail, or I don’t stop and smell the roses along the way. At the end of the day, what drew me to hiking is what draws me to trail running – the nature, the cool forest breeze, scrambling over downed trees, getting dirty, and feeling exhausted at the end of day. Trail running gives us all these things, but just allows us to cover more distance in a shorter time, and while carrying less gear. And compared to road running, trail running is easier on the body. Or so that’s what you always hear anyways. Personally, I’ve questioned if this is true the morning after 4-plus hour runs on the rooty, rocky, technical terrain of the north shore. But the gist is that generally, by landing on a softer, dirt surface, less force travels from the ground into your ankles, shins and knees than does from pavement. Also, your stride will be different as you adjust to the trail in front of you, so the movement is far less repetitive, and you also have more variation going uphill and downhill – which is great for working out different muscles. Beyond all those benefits, the local community of trail runners is full of amazing people. Some of the best friends I’ve made since high school I’ve made through running. In Vancouver we are blessed with access to some of the most incredible terrain you can wish for – hiking, walking, mountain biking, or running – its a shame to not explore it. We have it all, from super technical to nice and easy. From climbing 2,000m summits to running at sea level, it’s there, calling you. And for me at least, the best way to see it all is with my legs, running as much as possible. And I’m not the only one, as some of the best trail runners in the world now call Vancouver home (more on that below). So are you interested in learning how to get started? Well, listen up. The best way to start trail running is to start as a runner. By this, I mean come to the trails with some road running experience. You don’t have to be a college or high school track star. But, perhaps consider putting a 5km race under your belt. Starting with road running is a great way to learn about hydration, running form and your own level of ability. When you first get on the trail you’ll notice a few differences immediately. For me, I ran my first trail as a 8km race on Mount Seymour. Having just run the Vancouver Marathon (42km), I thought, 8km how easy will that be? Ha! It was the longest 8km of my life. Safety first. Trail running takes you into the forest, with all the inherit risks. The risks are probably higher because you’re more likely to take a spill, and you will usually be carrying less gear with you. Please see the below section on safety. Forget about pace. If you’re coming to trail running as a road runner, you might be used to tracking your pace on a GPS watch. Don’t do this on the trails. By all means, wear a watch, but don’t look at it during your run. You’re going to be moving much, much slower. Hills, rocks, roots, twists and turns are going to slow you down significantly so don’t be discouraged when you cover less ground than you’re used to. And in a dense forest with a curvy trail, your GPS is less likely to be accurate, anyways. Run by time, not distance. This ties to the above point. Instead of going out and saying ‘I’m going to run 10km‘ go out and say ‘I’m going to run for 1 hour‘ and don’t worry about the distance. Your mileage will vary greatly with the terrain you happen to find yourself on that day. Embrace the mud. If you’re running in Vancouver outside of the summer months, there may will be puddles, there may will be mud. Don’t bother trying to keep your socks dry and calves clean. There’s no point, so just run straight though that first puddle and embrace the wet. Yeah you’ll stink in the Starbucks line-up later getting your post run brew, but who cares? Walk when needed. You won’t be able to run all the uphills. Or, you might find an exhilarating stretch of downhill and push your pace too fast until your heart feels like its going to explode. That’s great. But don’t worry about walking to recover when needed. Even the pros walk sometimes. In fact, power hiking up steep hills is a race strategy and something that should be practiced! Use trail etiquette. Don’t be a trail-jerk and give runners a bad name. Share the trail with walkers and mountain bikers nicely. Politely call to people ahead of you to tell them you’d like to pass ‘on your left!‘ or ‘on your right!‘. Give them time to move over and don’t zoom by people on single-track trail. If you need to stop and nicely pass others, do it. Smile. Ask people how they’re doing. Littering is another big no-no, and you’ll get bonus points for picking up other’s litter. Just respect the trails and others with common sense. Watch your step! One thing I love above trail running compared to road running is that you have to stay in the moment. By this I mean you cannot zone-out and lose focus. If you do, you’ll quickly roll an ankle or find yourself doing your best Superman impression flying through the air. Look a few steps ahead of where you are going at all times so you’re not caught off-guard by roots and sudden drops. Run with friends. If you don’t have any trail running friends, no worries. The trail running community is one of the friendliest groups of people you’ll ever meet. There are more details on how to meet people to run with in the second post of this series. Ditch the headphones. If you’re on single-track that is shared with mountain bikers, you won’t be able to hear them coming (but you will feel their handle bars in your chest). It’s also a safety issue in the woods with bears and what-not. I know lots of people who run with their tunes on, but personally I don’t. I feel it takes away from the whole being in nature vibe – I’ve had owls fly right above my head that I would otherwise have been oblivious to! Smell the roses. The best part of trail running is the amazing scenery you get to see that 90% of the people in the city don’t even know exists. If you see something awesome, stop and soak it in. I think most trail runners get this and it’s why they love trail running. It’s also probably why all my trail-running friends are some of the biggest Instagrammers out there. Just #$%*$ do it. Put on a pair of shoes, find a trail, and start running. If you take one and only one thing away from this post, let it be this. The best way to commit yourself is to fork down the money and register for a trail race. Any race at all. 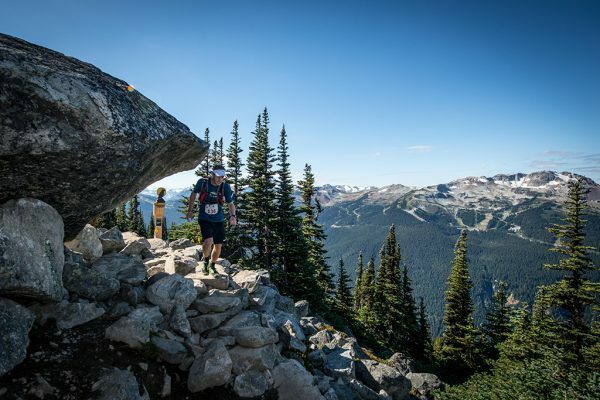 Running the Meet Your Maker 50miler in Whistler. Photo by Rob Shaer. Here is a list of things you may or may not need. Running at its core is the simplest of sports, so there’s no need to over-think gear. If you’re willing to risk breaking a few laws, even the clothes are optional. The following list is a list of optional gear, depending on where you are running and for how long. Going for a 30 minute run around Burnaby Lake? You don’t need a hydration pack or extra food. Going for a 6 hour run in the backcounty? Better have all of the below and then some. Use your judgement. Shoes. Yes, you can buy super fancy trail running shoes that cost $150. Do they help? Yes. Will they make you a super awesome runner? No. If all you have is a regular old pair of road running shoes, those are good enough to start out on. If you stick with trail running for a while, and start doing races and getting addicted to it (don’t blame me if that happens), then you can purchase some trail-specific shoes. Clothes. This gets a bit trickier depending on the trail you’ll be running on. If you’re running up a mountain, it will be much colder near the top. The weather can also change quickly in the mountains. Layering is always good and avoid cotton at all costs as it is a horrible material when it gets wet (this means your socks too). I recommend a good pair of running socks and a good technical shirt. Water. So you’re going to be running, but there’s no backcountry water fountains! What to do? The most popular options are a hand-held bottle (a glove that you wear which holds a water bottle), or a hydration pack. Hydration packs are great because you can also store your nutrition, safety gear, and extra layers in them. Food. This is personal. Good ‘ol running gels get the job done for most. Others have personal favorite foods to bring. Basically, any sugary snack that is easy to carry is going to be good to help keep you fueled on your run. There are books written on this alone, so the type of calories are up to you. But make sure you have those calories to fuel your body. Headlamp. There are many safety items you may or may not need to bring based on your particular outing, but this is a big one for me. If you get stuck in the dark, you aren’t going anywhere. GPS. It’s nice to track the distance of your runs and see your progress over the months and years. File a watch under ‘nice to have’. Cell phone. You may not get reception, but its better to have one than not if you need to call for help. Keep it turned off until you need it to preserve battery. This goes without saying, but all the regular outdoor safety rules apply. You don’t want to be one hour deep into a solo backcountry run, roll your ankle and be completely unprepared – not good. I’m not going to go into safety in this post, but there is a lot to consider. Including but not limited to – knowing the ten essentials. Being prepared for bears and cougars. Being prepared for the weather. For navigation and getting lost . For sudden weather changes… If you’re not sure about these things, there are trails within the city you can stick to for starting out. There is a safety section on the Outdoor Vancouver website you can read for starters (but even that is not comprehensive). Ideally, you can find someone with some experience to run with. You can then start on the easiest trails and build up from there. In the next post I will talk about some great trails to run on around Vancouver. For now, here are some of my favorite resources for becoming a student of the sport, and some local athletes you can connect with on social media. Look no further than the Salomon Trail Running YouTube channel. Most of these videos are created by a film production company called the african attachment in South Africa. There are dozens of 5-minute videos and each one of them are stunning. If you need any inspiration, this is the place to go. Run Wild Van Society. Run Wild Vancouver Society is a volunteer-based group of trail runners dedicated to raising awareness of safe backcountry travel by providing education and information, and raising funds for volunteer Search and Rescue teams around the Province. This is a growing community – follow them on social media to stay current on the trail running scene. The website also has a forum. Vancouver Trail Running. The de-factor book for…. Vancouver trail running. Maps, trails, descriptions, difficulty ratings. This is the book. I’ve reviewed it here. Trail Running Canada. A Canadian Trail running magazine; this is you’re online stop for gear reviews, blog posts, twitter updates, and a collection of Canadian records. That, plus an awesome free digital copy of the magazine comes out periodically. Born to Run. Author Chris McDougall’s best-seller does a phenomenal job of following along one of the most mythicized trail runners (Caballo Blanco) and legendary trail runners (Scott Jurek) and weaving together a beautiful story that digs into the essence of humanity’s need to put foot to dirt. Some say it is over-sensationalized, and it likely is, but it’s a book that’s hard to put down. Talk Ultra. This may not be a resource for beginners, but its a great trail running show. The podcast focuses on ‘ultra’ running events, which are those that are longer than the marathon distance of 42.2km. They are 3 hours a piece and come out every two weeks. Each episode features great interviews with the best in the sport. Personally I love this podcast, but if you’re new trail running and don’t know the races and big names, this may be a better sedative than anything. Endurance Planet. There are several different ‘shows’ on this podcast that come out each week. One on nutrition, one on general endurance sports, one on ultra running, etc. Each show is basically a Q&A between the hosts and the listeners. You can learn a ton from this podcast. I particularly love the advice from ultra-runner Lucho. Ultra Runner Podcast. Another one that focuses on the ultra distance, but has great weekly interviews. As I said at the top of this post, there is no shortage of amazing trail runners around Vancouver. Not only amazing in ability, but personable, friendly ambassadors for the sport at large. Here are a top few I’d recommend keeping up with on their blogs and social media in case you ever want to reach out for advice, or just want to follow along for inspiration and education. Gary Robbins. Gary is actually how I discovered trail running after learning he set the fastest-known-time on the West Coast Trail. For perspective, the West Coat Trail is normally tackled as a 3 to 5 day hike. Gary ran the whole thing, point-to-point, in 10 hours and 8 minutes. Gary. Ran. The. Whole. Thing. In. 10. Hours! Gary is from Newfoundland, now calls North Vancouver home, and aside from being one of Canada’s top trail runners is one heck of a friendly and funny guy and co-race director for a few local races. He’s very active on social media, so check out his blog, his Twitter, and his Facebook. If you follow him on only one platform make sure it’s his Instagram. Dude has skills with an iPhone too. Ellie Greenwood. If Gary is one of the best male trail runners in Canada, its safe to say that Ellie is one of the best female trail runners in the world. Aside from winning local races like the Vancouver Marathon (no big deal, right? ), Ellie holds the course record on the Superbowl of trail running – The Western States 100 miler in California, which is a historied race that draws the best from around the globe each year. Ellie is from the UK and now calls North Vancouver home. Ellie is a little less active on social media than Gary, but is no less friendly and personable in real life. Check out her blog and follow her on Facebook and Twitter. Jeff Pelletier. Jeff is a born-and-bred Vancouverite and an avid trail runner. And by avid I mean Jeff lives and breathes trail running. Jeff is a member of the Salomon Flight Crew, and is sponsored by Suunto, Clif, inReach Canada and knows everyone in the local running community. Jeff has a great blog, Instagram and Twitter accounts. By trade Jeff works at a video production company, which means his YouTube channel is phenomenal. He has great videos of his trail runs in Nepal and the Grand Canyon to name a few. Solana Klassen. Solana is one of the most dedicated trail runners I know. Also born-and-bred local, Solana is the race director for the 5 Peaks series of races (and Yeti snowshoe races), which are talked about more in part three of this series of posts. Solana also hosts a women’s only series of friendly trail runs. Solana blogs a lot about running and her website is full of great advice and insights for local races and trails. She is also very active on Twitter and Instagram. Tom Craik. I don’t know anyone in the local trail running community more beloved than Tom. Tom runs for the Salomon Flight Crew and, aside from being ridiculously fast, he is always out at all the local events, either running or volunteering with his adorable daughter. Tom’s website is here, and he is active on Twitter. Karl Woll. That’s me. I’m not nearly as cool as the above people but I’m glad to help out with any questions you have. Connect with me on Twitter or email me through my website. That’s it for a crash-course to trail running. In part two of this series I will highlight all the best trails to run on around Vancouver. i would like to explode some trail running in Vancouver. Glad you will be able to visit Vancouver and do some trail running! There are lots of great places to run. Depending on what part of town you will be in in I can give you some recommendations. Also, if you check back here on the Vancouver Trails blog in another week or two – there will be a new post answering exactly this question of what are some of the best places to run. Please feel free email me at karl [at] outdoorvancouver [dot] ca with the details of your trip and I’ll be glad to give you some specific recommendations based on your ability, location, etc. I am a bit new to this site. I was wondering if someone can help me with tips on how to train for trail running because I live in an area (Ottawa) where there are no trails unfortunately. Was thinking if there is something that I can do which can mimic trail running on road or even on a treadmill. I will thoroughly appreciate some guidance. Hi Naz. Hmmm I’ve honestly never been to Ottawa but there have to be some urban trails of some sort?! What I would recommend is if you are on a treadmill, you can set the incline up and do some intervals (something like this http://www.pponline.co.uk/encyc/treadmill-exercise-how-to-perform-hill-training-317#). Otherwise, you can find a small hill somewhere and do repeats on that in a similar way. Run up the hill hard, then jog back down, repeat. Stairs are also great for that at a local stadium or even inside a stairwell in a building! (Not ideal but better than nothing). Anything that will get those quads and hamstrings working more so than your typical road running. Basically any way you can find to add hills into the run will help out. I’m sorry I can’t be of more help. But I’d also try reaching out to one of your local running stores and see if they can recommend some nearby trails! Thanks a lot for your advice. There is a place called Gatineau hills near Ottawa but one require a car to drive out there and so on and so forth. However, I thoroughly appreciate your hill recommendation. It means a lot as it comes from someone who is familiar with trail running. I will get some hills into my training, there are quite a few in the neighborhood. The local running club don’t typically cater trail runners over here….that’s the downside of living in the capital. There might be a few but they all go to gatineau hills. To maintain regularity, i am not sure if i am fond of going to gatineau each time.Count yourself lucky since you are in Vancouver. Again, thanks so very much for you advice. I listen to that podcast (Endurance Planet) and I know ages ago on an episode they addressed this exact question. I tried to search it out but couldn’t find the podcast, but the article is good. Good luck! Thanks for the very informative article. Much appreciated. Hope that you are okay. I have a question in regards to choosing a race, I thought that there is no better person than you who can guide me. I am looking into doing a 50km trail, but not mountains or anything because you know that in Ottawa there are no trails to practice on, however I am following your previous advice. I was wondering that perhaps you might be able to guide me towards which one to pick in BC.I want to get the feel of what the trail are like and how it is to run on them. You have far more experience than me on this topic. I will appreciate your guidance. I think we hit too many nested-replies in the thread so replying to your last question here. Honestly, I don’t know if there are any 50km races around Vancouver that don’t use mountains (that’s where all the trails are!). If you’re going to travel all the way out here to race a 50k, you might as well jump right and and get the full experience. I’ve raced with people from Saskatchewan before who were doing their first 50 MILER and had never trained on any hills… I’m sure as long as your overall fitness is good, you will get to the finish line. But that’s not to say it will be easy! First of all thank you for always taking out some time to reply back to my paranoid questions. Its a great help to get some guidelines from you. Ottawa lacks in the ultra community, we have a marathoner under every rock over here, but to find someone who goes beyond that distance is like finding a needle in the haystack. Also, the running culture over her is all speed oriented, if you are not fast then you are not a distance runner, which I find terribly discouraging for a newbie like me who want to get into larger distances. Hence, I always throw my questions at you and appreciate your advice. You are right, if I plan to come to Vancouver then I should just bite the bullet and do the whole deal. I am looking into the list you have given. Again, thanks alot for always replying back with valuable info.